Reader Trish IMs: What is a good idea for an engagement gift? Shot of Brandi IMs: What’s the price range? Engagement gifts can be tricky – the couple typically hasn’t registered yet and you don’t want to spend a lot of money because you know that you’ll be heading to the ATM for the shower, bachelorette and wedding. 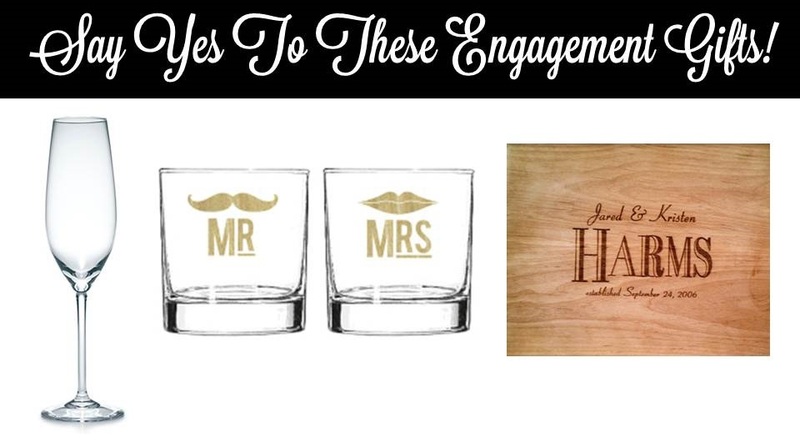 So here are my suggestions for engagement gifts for the couple. · Cutting Board: Something a bit more personal, I love this cutting board with the couple’s name and engagement date from Etsy. · Restaurant Gift Card: Finally, a gift card to a local restaurant is also a good idea. If the couple needs to save up for their wedding and honeymoon, they may cut back on eating at restaurants, so this gift card would come in handy for a nice night out! And for your newly engaged lady friend, here’s two past engagement gift ideas here and here. Other ideas include a subscription to a bridal magazine, wedding planner and books or anything that says “Soon to be Mrs” like stationary!